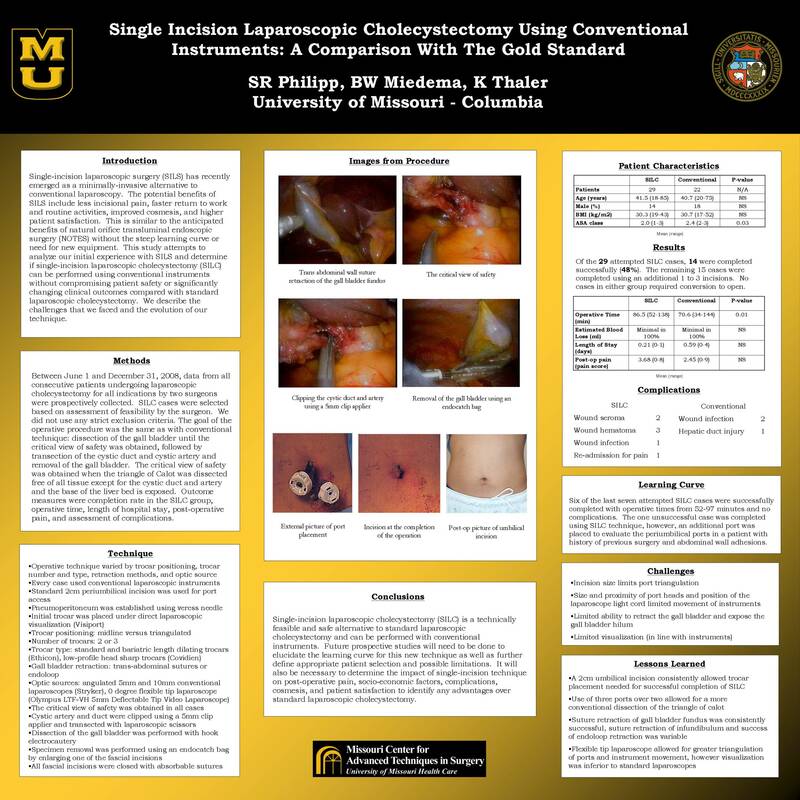 OBJECTIVE: The aim of this pilot study was to analyze our initial experience using single umbilical incision cholecystectomy (SILC) with conventional laparoscopic equipment in comparison with standard laparoscopic cholecystectomy (LC). METHODS: Between June 1, 2008 and September 30, 2008, data from all consecutive patients undergoing LC by two surgeons were prospectively collected and retrospectively analyzed on an intention to treat basis. SILC cases were selected based on assessment of feasibility by the surgeon. The procedure for SILC varied by retraction techniques and port placement with the goal of obtaining the critical view of safety. Outcome measures were completion rate of LC using a single incision, operative time and assessment of complications. RESULTS: From 27 cholecystectomies performed during the study period, SILC was attempted in 16 patients and successfully completed in eight (50%). The other eight patients required 1-3 additional incisions. The critical view was achieved in all cases. Placement of transabdominal sutures allowed for adequate anterior retraction of the fundus and lateral retraction of the infundibulum in some cases. Visualization was improved when using a flexible tip laparoscope (Olympus LTF-VH 5mm Deflectable Tip Video Laparoscope). The close proximity of ports at the umbilical incision decreased range of motion and limited triangulation making the operation technically challenging, although average operating time for attempted SILC was not different compared to standard LC (86 vs 70 minutes). Intra-operative complications in the SILC group included a cystic artery injury and two cases of bile leak after placement of retraction sutures. The only complication in the LC group was a grade I hepatic duct injury. There were three post-operative wound complications in the SILC group and none in the LC group. CONCLUSION: SILC using conventional laparoscopic instrumentation is safe but has limitations. Development of new medical devices, instruments, and techniques will be required for more consistent success. Further studies should define selection criteria and determine any benefits compared with standard LC.